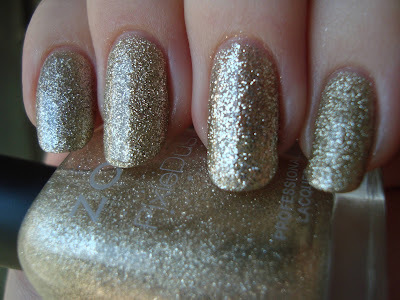 Tomoko is a textured white gold glitter in a clear base. I'm a little surprised that this was chosen as a fall shade. It looks so xmasy to me. I originally tried two coats, but that was too sheer so I added a third. It applied really well for a texture. Some can get lumpy or globby, but both of the Pixie Dusts I've tried have gone on smoothly and evenly. I love the glittery finish, but it's tough to clean off skin. That glitter is sticky! The color is almost exactly half-way between gold and silver, really more of a white gold than anything else. I like it a lot, but it makes me wonder if they're doing a holiday Pixie Dust collection or not. A rich copper would have felt more autumnal to me than Tomoko does. I'm really not complaining, I'm just surprised. With top coat it looks even more festive and reminds me of something specific from last xmas. If I hadn't top coated Tomoko, I might not have thought about Essie Beyond Cozy, but once I started wondering I just had to compare them and see. I also grabbed Urban Outfitters Smokin to see how close it might be. This is two coats of Beyond Cozy, three of Tomoko, and four of Smokin. I can't quite call either of them dupes. Beyond Cozy is finer and denser than Tomoko, with a slightly cooler tone. Smokin is less dense, has glitter and microglitter, and is silvery-er. Still they're all similar and if you're pickier than I am you might be happy with just one. Which is right for you would depend on how you'll use it. Smokin is the least expensive and can be layered over other polishes, Beyond Cozy has better coverage, but Tomoko is the closest to white gold and looks better pre-top coat than the other two do. The differences are a little more obvious in brighter light. Bottom line: I like it, but it's not completely unique in my collection. While I don't really get a fall vibe from it, it is very pretty and I like it pre-top coat more than post-top coat. I think that's a first for the textured polishes I've tried. The other seven fall Zoyas I bought in that promo will have to wait until another day. This week has been annoying. I've got fluid behind my eardrums and it's taking its time draining. I feel less "underwater" today than I have in a few days, but it's still bugging me. Maybe that's why I slept so much. I also had a rough night last night. My roommate and I went to the nail supply store, but we got stuck behind a motorcycle accident that blocked two of the three northbound lanes. I don't think it was too severe, because I couldn't find news about it. Still, it brought traffic to less than a crawl for a few miles. Frustration continued once we finally got there...no OPI San Francisco yet!! UGH!! I did buy my picks from China Glaze Autumn Nights, but...UGH!! Good excuse to go back, I guess...just not during rush hour! I shouldn't gripe too much, I still have some spring and summer stragglers to swatch. Agghhhh, so glad you did a comparison of Tomoko with Beyond Cozy!! I'd been wondering that same thing the last few days but hadn't seen anyone else in the blogging world address it, so THANK YOU!! 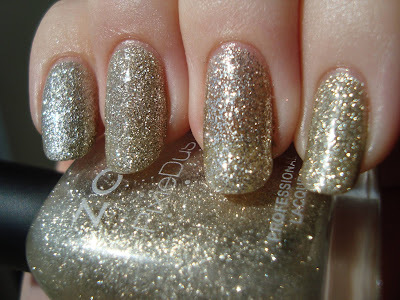 Beyond Cozy is one of my favorites, but I have a weakness for the Zoya PixieDusts so it's been tempting to purchase Tomoko. Now I may not *need* to get it, which is good because holy moly, have I bought a lot of polishes lately! lol Welcome :) I love doing comparisons. Yeah, good point, wait for a promo I can do that....I think....maybe..... lol! Ooh, I like! Tomoko was the one that caught my eye when I first saw the press release.